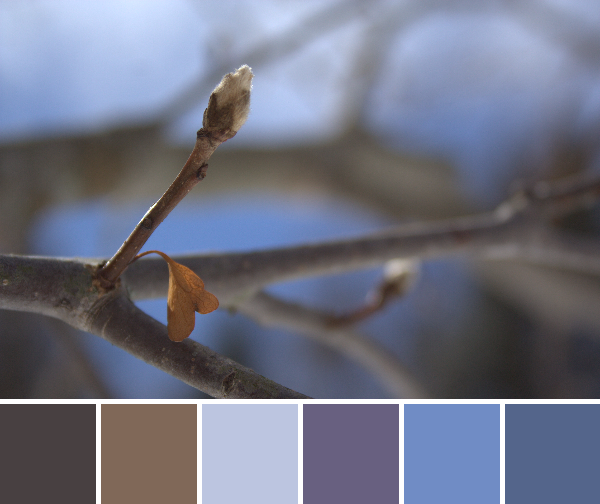 You would think that by now, nearly to April, I would have a few signs of spring to share in this week’s color inspiration. But lo, Maine has not yet gotten the memo that spring begins officially tomorrow and the temperatures have been in the teens, with a rare high of 30. So I decided to embrace the winter for a little longer, and showcase some more of nature’s frigid beauty. 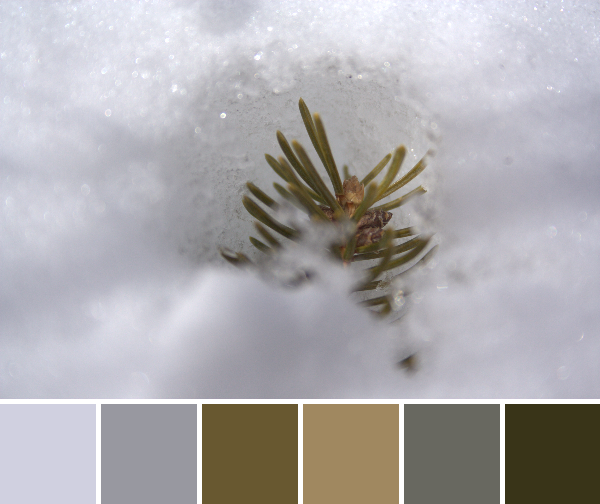 Color palettes are created using Play Crafts’ Palette Builder 2.1 and my photographs. Believe it or not, this cute little weather vane sits atop quite a large cupola that we removed from the chicken coop roof while winterizing it. 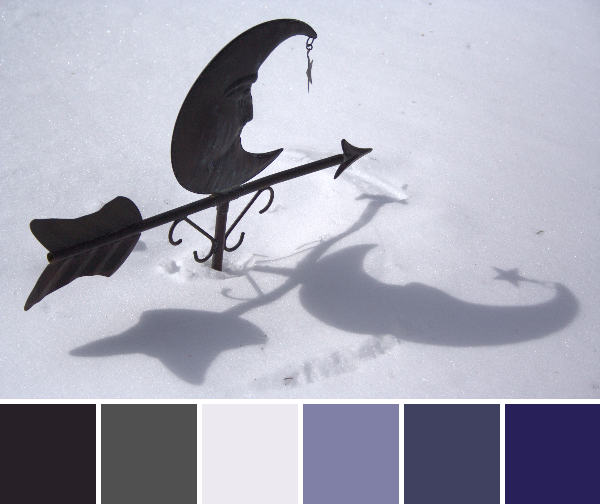 The snow is still a good 3-4′ deep, but the beauty of the whimsical moon pointing toward spring with sunny shadows cast on the deep snow had to make its way into a palette. As cold as it is, I personally love this palette. Blues and greys will definitely become a Storm at Sea quilt one of these days. Perhaps I’ll use this palette for planning! A little pine branch, nestled in the icy depths. I was really hoping for a bit more green to read through, but really, the season for green is not *yet* upon us. This instead is an earthy, neutral palette, with just a touch toward green with that final Moss-Army Green. Shhh don’t tell anyone that these magnolia buds are on the tree all winter long. I’m pretending it’s a sign of new life! Spring! Blue skies at the very least are peeking through. The warm sun shines, and surely, SURELY spring must not be too far behind. Right!? What season are you experiencing right now? Are you eager for the next, or enjoying the current weather? I find it easy to enjoy winter until those first teaser warm days. Then my mind is on planting seeds, raising chicks, digging in the earth, and spending our days outside. Our entryway may be full of potting soil in the very near future! Okay Kitty – we just got wacked with our second snow storm in two days. And this one was a doozy. The stop sign at the end of the road just has his red head poked out and the pole is lost in a drift. the piles at the end of the driveway (all hand shovelled by my husband and me) are at least 8 feet tall. And we got 80 cm or almost 3 feet from Tuesday to Wednesday, The city took the buses off the road, university was closed for two days (it is March Break for the kids). My road didn’t get plowed until this morning so yesterday was a vacation day for me – made another hexi flower for Jodi’s project. I hope is is a slow melt or we will need the ark. Google Halifax Nova Scotia and I am sure you will find lots of pictures. so sorry Spring is taking it’s time but it will be even more treasured when it comes. Love the color combos! Though it does not look that way out the window, things are feeling just a little more spring-ish in Nova Scotia today. Blue skies and sunshine sparkling on the unGodly amount of snow filling every available space outdoors. Love your wintery pics, but I’m looking forward to seeing some of those sweet spring greens popping out soon! spring lol here in Guilford maine we are still buried in snow…And talking another storm saturday….Supposed to go sewing in Athens Maine grrrr hope it stays away…..